Back in the summer while work on the restoration project was still in the building phase, children from several primary schools in Keighley put together a collection of objects – newspaper cuttings, coins, stamps, things they’d written – to seal up inside a time-capsule to be buried under the Norfolk Island Pine beneath the dome in the glasshouses. Ingeniously constructed from sections of drainpipe it looked very impressive, but it didn’t get buried at the time as the glasshouses were then still a building site. However last week it was carefully placed in a hole dug and prepared for it, and covered over and completed with a stone plaque instructing that it should not be reopened before June 2067. I Iove time-capsules. When my sister and I were children we used to write notes and hide them in the house whenever we could. Not long ago one turned up behind the bath panel where it had been walled up for 50 years, and the current owners of the house were delighted with it and managed to contact us and send it on. The whole idea of walling something up or burying it so that at some distant time it will be discovered and explored by someone living in the future feels a bit like time-travel, and it fascinates me. All through the excavation and demolition phases of the restoration at Cliffe Castle we were hoping that we just might unearth a buried or hidden message, a Butterfield time-treasure purposely concealed – but nothing came to light. There were things that had been dropped by accident or thrown away – a milk-bottle, a couple of Victorian coins, jugs and jars and pieces of pottery and numerous mysterious rusty metal objects that were hard to identify, and all their stories remain tantalisingly untold. All this got me thinking what I would put in a time-capsule if I were to make one now, and it would certainly be drawings, or whole sketchbooks. 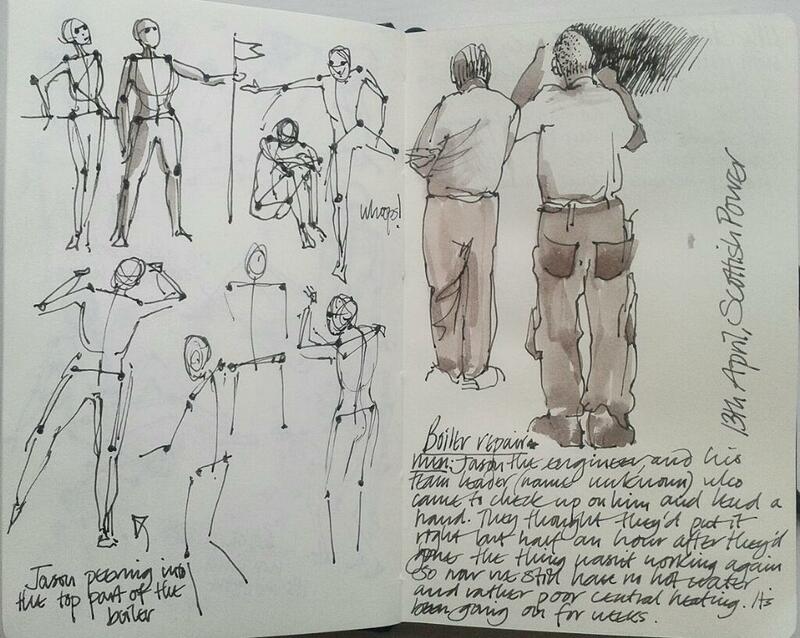 I often feel that sketches are frozen moments in time, almost like fossils. They record the moment something happened and how I saw it, what it meant and how it felt – something that passed through me and ended up on a piece of paper. The delicate operation of guiding the dome into place on top of the glasshouse. It was a hugely challenging thing to draw because the crane was so enormous, there was so much going on and it all happened fairly quickly – but I couldn’t miss the chance to see what I could get on the page. I certainly remember what went on better from having sketched it – even if this meant focusing on some things and missing others. 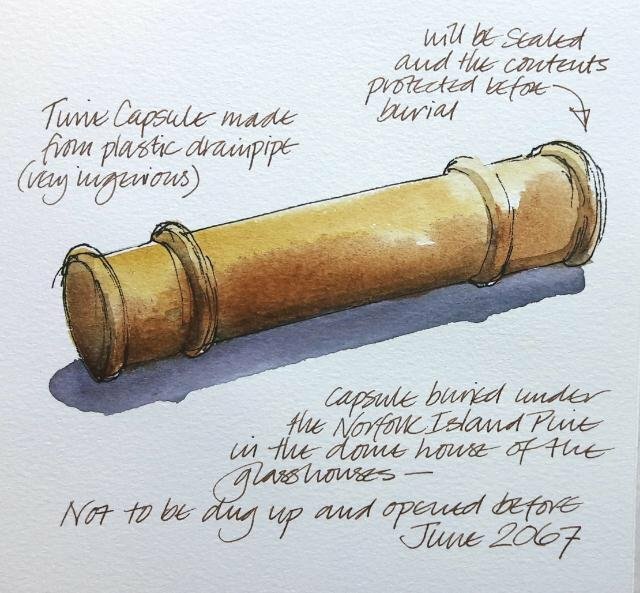 I suppose you could say that this whole project, Drawing The Work – and the posts on this blog – are a kind of time-capsule, except of course that they’re not buried or hidden; the posts will stay here for anyone to see. Some of the visitors at one of the Heritage Walks, listening to Claire pointing out features and explaining the building work. 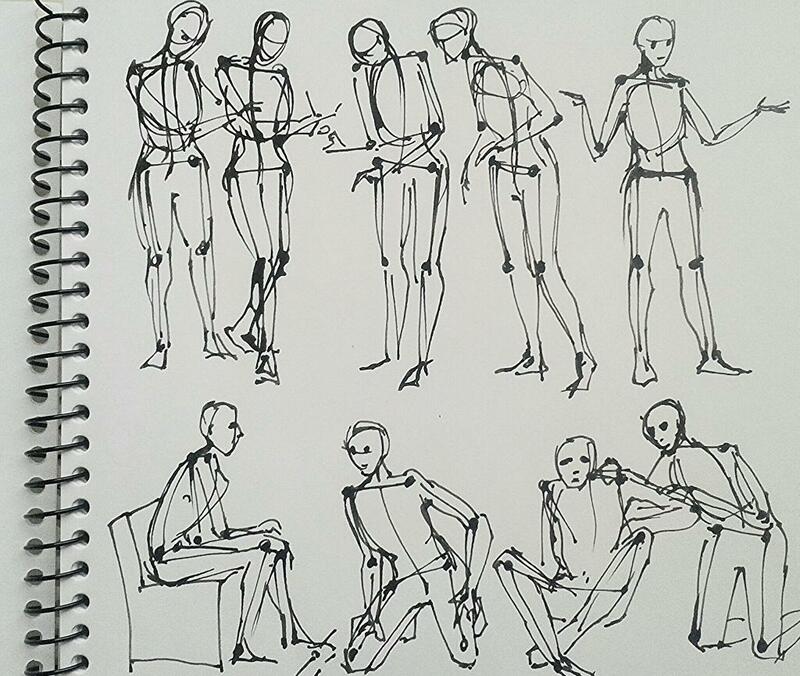 I love sketching people when they’re engrossed in looking and listening because they’re unselfconscious and much more interesting to draw. The work of the restoration is now almost finished, and from now on, my sketching will be more about life in the park rather than the work of restoring it. A big celebration to mark the completion is going to take place in the park and museum shortly before Christmas on December 10th. The exhibition of Drawing The Work goes on in the museum until January, and we’ve produced greetings cards using a selection of my sketches which will be on sale at the Christmas celebration and in the museum shop. My Cliffe Castle posts here will now mostly be under the heading Life In The Landscape, and I’m looking forward to a whole new programme of sketching possibilities. Hope you’ll follow me on the adventure! Know what this is? I knew what it was as soon as I saw it because I’ve wanted one for ages – it’s a hotel for hibernating insects. It stood centre-stage in the Pop-up Park, the exhibition/event that Bradford Parks department and the Conservation Group put on in the Airedale shopping centre all last week. 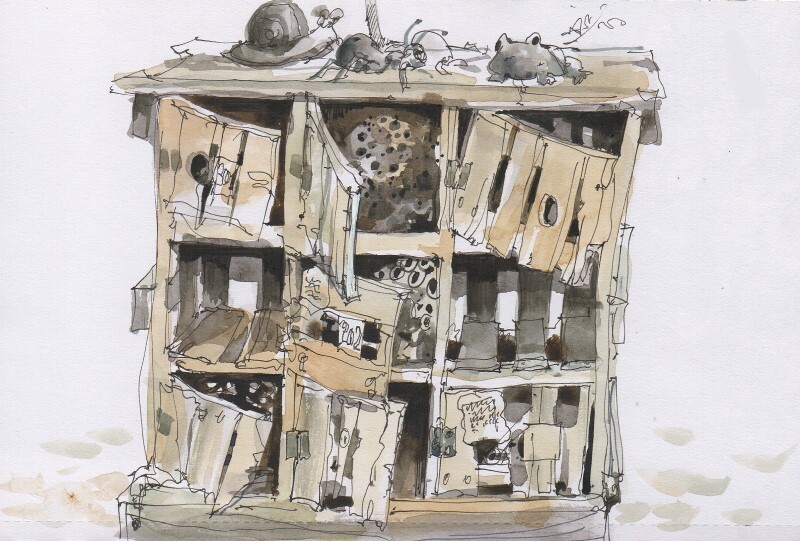 I got so excited by the insect hotel that I ignored everything else for a while as I sketched it and enjoyed its lovely wonkiness. This is a very superior model – many are simple box constructions, sometimes quite small – and this one is also a teaching aid to use with children, with doors to open and close and questions to find answers to. But how lovely it would be to have an insect residence in the park! Bees have been a part of park life at Cliffe Castle for a long time and many, many people have come to watch them as part of a visit to the museum – but probably just as many people don’t know that they’re there. (The hive is moved to East Riddlesden Hall in the winter and comes back to Cliffe Castle in the spring.) 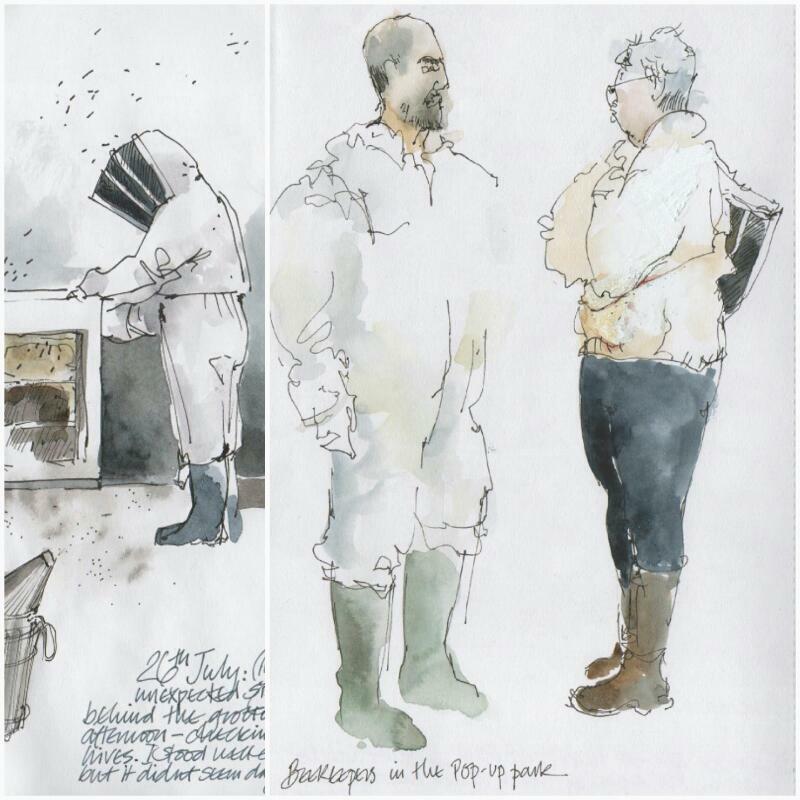 There were beekeepers in the Pop-up Park on several days during the week, chatting to visitors – and I managed to catch some in action just outside the museum one memorable afternoon in the summer, when they were checking the hive which they’d brought out to a quiet corner behind the grotto. There’s plenty going on at Cliffe Castle over Christmas, and if you’re interested in the restoration of the park, have a look in the windows of the Conservatory where there’s a display called ‘What the Dickens’ showing some of the plans for the restoration project – but don’t miss going inside to see the Conservation Group’s very funny and clever homage to Charles Dickens’ – ‘A Cliffe Castle Christmas Carol’. Would you like to give your views on events in the park, and its café? Cliffe Castle Park group would like to know your thoughts on events. You can answer these questions in the comments box on the Contact page here, or write them on paper and hand them in at the museum. What good events have you been to already? What good events have you gone to in other parks? Do you go with family/friends? At what season/s would you like to have park events? Any suggestions for the kind of future events you’d like to go to? When would you like/need the park’s café to be open? What sort of food and drink would you like to be available? Do you think what’s on offer should change by the season/week/day/occasion? Any comments? Would you like to use the café as a meet-up place? Do you think dogs should be allowed in the café? Have you any suggestions for the café? Thanks for helping by giving us your thoughts and ideas! 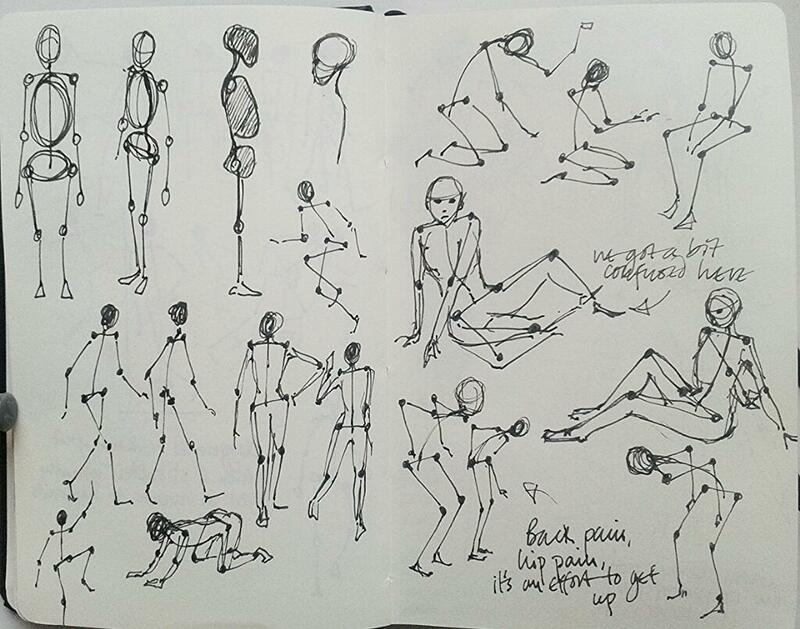 This summer I’ve been drawing people more than ever before, whenever I’ve had the chance – and athough I find it compelling (it’s becoming addictive), I still find it quite intimidating, particularly when I’m sketching in a crowded place. I’m always anxious that someone won’t like being drawn and I don’t want to make anyone uneasy or uncomfortable, though I have to admit that actually this seems to happen fairly infrequently. I thought the Teddy Bears’ Picnic at Cliffe Castle this week would be full of sketching opportunities, and I certainly found plenty of unselfconscious children (both with and without teddies), alongside a lot of slightly less comfortable adults (also with and without bears). I’d also hoped to find interesting subjects amongst the bears themselves, but especially at first they proved to be elusive as many of them were small and the picnicking groups were spread out, so to begin with I warmed up by drawing the first group I could watch unobtrusively even though there were no visible teddy bears. I wasn’t feeling terribly well that day and this made me even more nervous, but as usual once I’d started drawing I stopped being aware of anything else. Feeling more relaxed I wandered over to a spot that was dotted with picnic blankets spread on the grass where families and bears were having lunch, and I sat myself down under a tree. I’d imagined that I’d have the chance to do some studies of individual bears, but I quickly discovered that teddies don’t stay in one place for long when they’re accompanied by their owners. However as the afternoon wore on tiredness set in, and I was able to find one or two interesting characters who’d been left to relax on their own. The party was gatecrashed by a few non-bears. Just in front of where I was sitting a couple of soft fleecy dinosaurs spent a quiet half hour dozing, and I spotted several fluffy individuals that looked to me as if they might be rabbits. No-one seemed to mind. I wished I’d brought my rat. 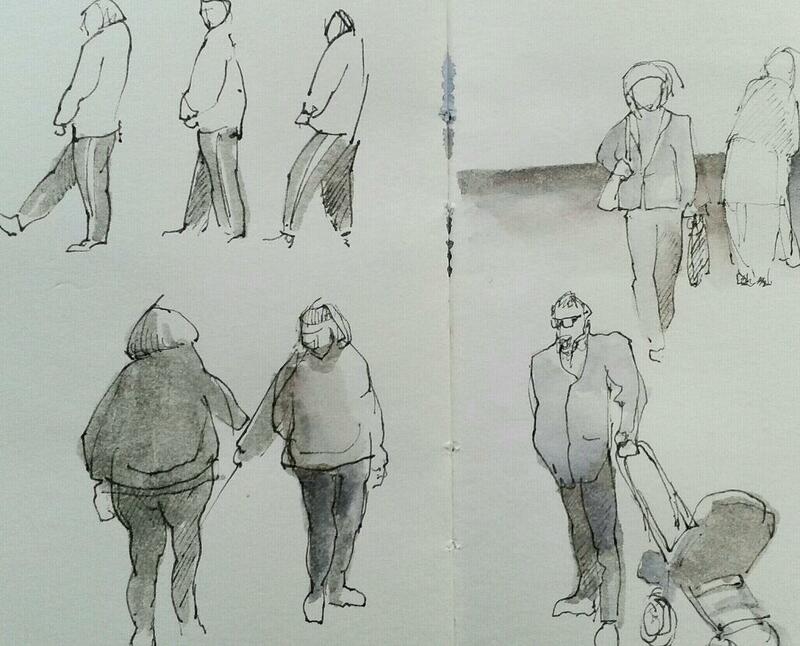 One of the things that impresses me most about Urban Sketchers is the way so many will draw just about anything they see in front of them. 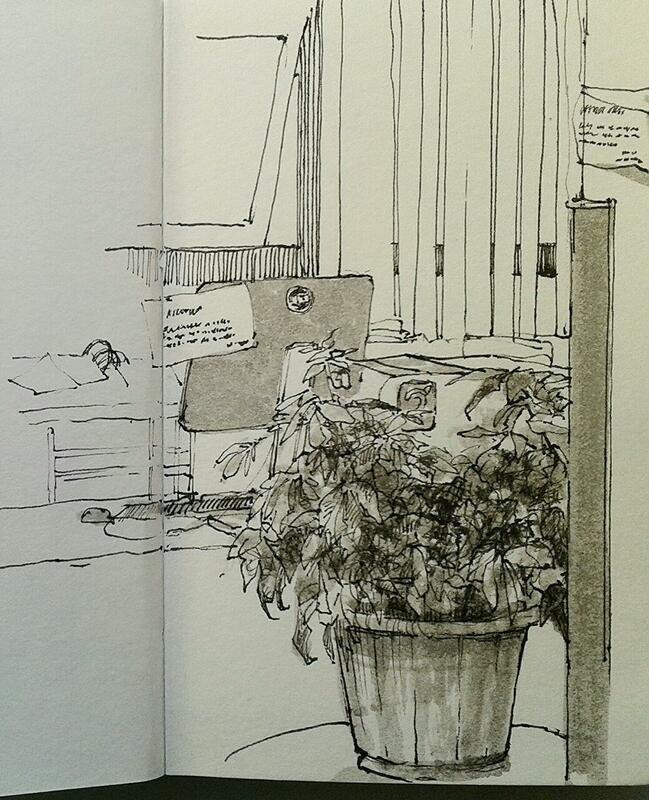 I’ve seen lovely sketches of feet, of corners of bedrooms and living rooms, even drawings of full garbage bags. 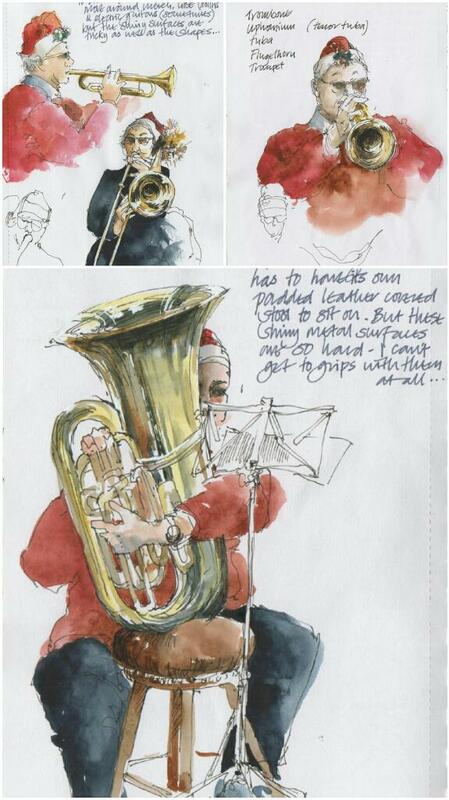 It’s taken a shift of attitude for me to see the attraction in this – I used only to want to draw when I found something excited me, but increasingly I’m discovering the addictive pleasure of just drawing what’s there, wherever I am. The whole of one afternoon last week I found myself sitting in a hospital outpatient waiting room, waiting for far longer than I’d expected and with nothing more interesting to look at than a not too healthy plant in a large pot, in front of the usual paraphernalia of office and reception desk clutter. Computer screen, keyboard, files, papers, electrical wiring, and notices on bits of paper stuck randomly here and there informing us and warning us of things. (I didn’t read them.) But after a while I thought that here was an opportunity to draw something that didn’t interest me much, purely as an experiment, so I spent the next half hour doing just that and found after 5 minutes that it did interest me after all. 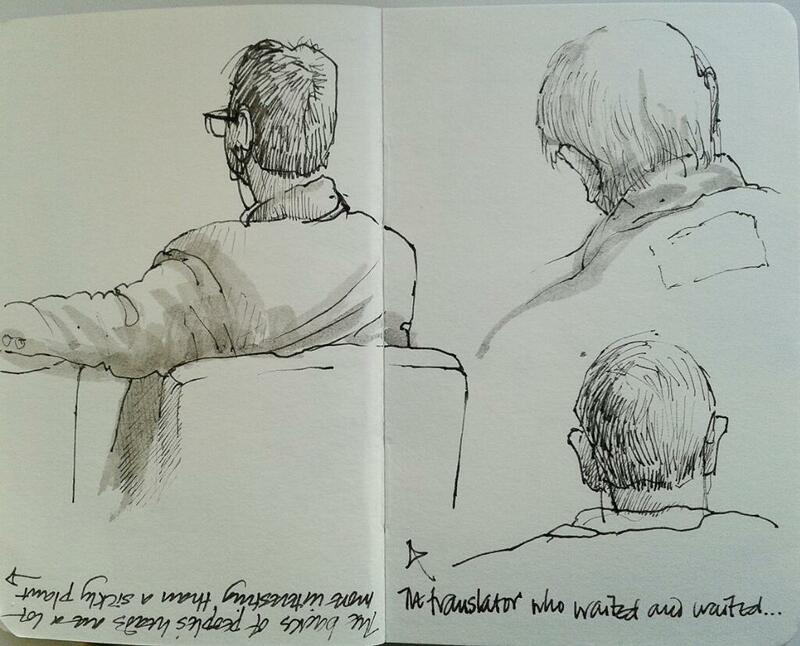 However as the seats in front of me in the waiting area filled up, things appeared that appealed to me much more and I spent the remaining part of the afternoon sketching the backs of people’s heads. These are just some. There were more husbands (or sons) waiting for wives (or mothers) than there were wives or daughters, so I had a whole series of back views of men to look at, keeping still for several minutes at a time. (It’s interesting that people move far more than they probably think they do when sitting in waiting rooms.) Do men’s ears grow bigger as they get older? I’ve often wondered because from observation I’d say they do, but it seems rather odd that they should. One of the younger men was a translator who had come to keep an appointment with a patient who needed an interpreter, only the patient never turned up. There was an attempt by the receptionist to contact him by phone – it’s impossible not to overhear things like this even if you try not to listen – but with no success. I wondered if he had mistaken the day, or the location, or simply forgotten, and I’ll never know. I was hoping I’d hear the translator speak on the phone as he offered to help, and I wanted to hear what language he’d speak as I couldn’t work out from his appearance or his accent what it might be, but I never got the chance. He got his papers signed and validated so he could claim his expenses, and left. I never mind waiting as I don’t think of it as time lost, even when I’m just sitting still. Getting into the habit of sketching anything, anywhere, makes me look forward to the next time I have a good long time to wait.